It is extremely difficult to do justice to this book. Twenty-four hours after finishing it I am still deeply involved with the emotions that were generated by reading it and that is, for me, a sign of a book that is beyond excellent; dark, disturbing and downright nasty. THE KEEPER will have you looking at people twice and making sure you lock the door at night. As to opening the door to strangers – well, I won’t be comfortable doing that for a while. Although I enjoy a number of different types of crime fiction, ‘well-written but dark and nasty’ is my favourite sort and this one is head and shoulders above most. 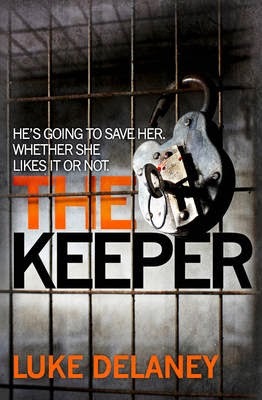 THE KEEPER is Delaney’s second novel to feature his hero DI Sean Corrigan. The fact that it is his second novel ever is enough to take your breath away. This man has talent! Delaney’s past life in the MET and CID add a deadly ring of authenticity to his work. One is left wondering how much of his story writing is actually autobiographical. To whet your appetite without giving the game away, Thomas Keller is looking for Sam. He loves her and knows she loves him. He is desperate to find her and keep her safe from harm. Only trouble is, he keeps finding lots of women that look like her and are pretending to be her. They deceive him with their lies and distract him from finding the real Sam. He has no choice but to dispose of these fake deceivers so that he can find and rescue Sam, as he knows she wants to be. Enter DI Sean Corrigan. He has an uncanny knack of getting into the mindset of the killers he is charged with finding and, when Louise Russell goes missing, he is soon focused on identifying this latest crazy man before Louise turns up dead. He gets closer and closer to his quarry, hampered by an over zealous criminal psychologist and team members who are not quite telling him the whole truth all the time. Can he work his magic before it is too late?